July 1, 2018. New Delhi, India – This morning His Holiness the Dalai Lama met with delegates who had participated in a Second Dialogue on Vinaya. 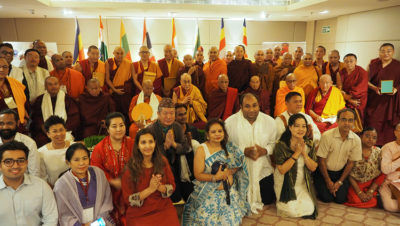 They included representatives of the Sri Lankan, Burmese, Thai, Vietnamese, Taiwanese, Indian and Tibetan Buddhist Traditions. Among reports read to the gathering was one from a senior Elder of the Thai Forest Monk’s tradition, who approved of the spirit of the meeting, but expressed regret that since proceedings were being held in a hotel it was inappropriate for him as a Forest Monk to attend. Nevertheless, he encouraged delegates by quoting the Buddha’s having told Ananda that after his passing away, the Vinaya would be the disciples’ guide. He added that as long as the Vinaya prevailed, the Buddha’s teachings would survive. Further reports clarified that in their discussions delegates had recognised that although the various Vinaya traditions may vary in the numbers of specific precepts, they shared the seven fundamental divisions of the Vinaya. There are proposals for further such dialogues to be held. “I am a Bhikshu, who received full ordination in 1954, and I belong to the Nalanda Tradition that was introduced to Tibet from India in the 8th century. The person primarily responsible for this was Shantarakshita, one of the foremost scholars of Nalanda University, a Bhikshu, philosopher and logician. 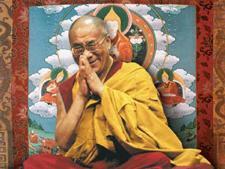 He was invited by the Tibetan Emperor. The Nalanda Tradition places great emphasis on the use of reason over mere faith. “One important question to ask is whether the teachings of the Buddha that are more than 2600 years old remain relevant today. “The last century was torn by war and violence, mostly because of the prevalence of old ways of thinking, the inclination to try to solve problems by use of force. One of the continuing consequences is that while we are gathered peacefully together here, at the same time, elsewhere, people are being killed, are starving to death or are being discriminated against on the basis of race, colour or caste. Meanwhile, all major religious traditions counsel love, compassion and forgiveness. They each have the potential to foster peace of mind, which is why I respect them all and seek to encourage religious harmony. His Holiness acknowledged the fundamental importance of the teachings of the Four Noble Truths and the Thirty-seven Factors of Enlightenment, as preserved in the Pali Tradition. However, he also noted that the writings of great masters such as Nagarjuna and Aryadeva, who based their insights on the second Turning of the Wheel of Dharma at Rajgir, are also very useful for sharpening the mind. Representatives from Burma, Taiwan and India presented gifts to His Holiness. He in turn presented statues of the Buddha to the Elders who were seated with him. Shortly afterwards, His Holiness also met his friend Tom Tait, the Mayor of Anaheim in California, who declared his city a City of Kindness. His Holiness reaffirmed his enthusiastic support for Mayor Tait’s approach that has resulted in happier, more fulfilled and more successful students in Anaheim. He reiterated his view that while many people consider sensory experience as the main source of happiness, really it is peace of mind. What destroys peace of mind is anger, hatred, anxiety and fear. Kindness counters this—and through appropriate education we can learn to tackle such emotions.